The plans for next summer’s language and culture course are already coming together very quickly and, in order to get a real flavour of our chosen home for the week, who better to ask than Donna Devaux. Donna was one of the students on this year’s Orebić course and she and her husband also own a small house in Cavtat. So she is uniquely placed to give a real insight into what prospective students on the 2015 course can expect. When I spoke to Donna, she told me how she and her husband came to buy a house in Cavtat, the work that had been involved to make it into a lovely home and the reasons she so loves being in Cavtat. This is her story. It all began at the very beginning of the new millennium, when her son and his Croatian wife-to-be were holding their wedding in Dubrovnik. Apart from one brief visit to the area a quarter of a century earlier, this was Donna’s first visit to Southern Dalmatia. During the time she spent here, she rapidly grew to like the area very much and her new daughter-in-law’s father was quick to suggest to her and her husband that it would be a great idea to buy a property somewhere. 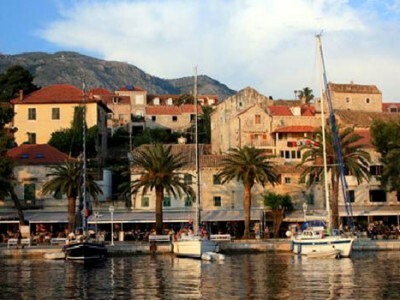 Nowhere quite fitted the bill until they arrived at Cavtat on a boat from Dubrovnik. Donna knew immediately that this was the place for them. It was such a beautiful little town and was just perfect. When the ideal property for them came onto the market, they had to decide whether to buy within a week but, dropping everything to dash out to Cavtat from England, they fell in love with it the moment they saw it. It was a tumbledown mess and practically every feature of beauty had been ruined by the previous owners, who had tried to turn a small three-bedroomed house into a six-bedroomed back-packers’ B&B. The back garden was full to bursting with all manner of rubbish that looked like it had been building up for fifty years – everything from washing machines and hundreds of bottles to discarded AC units & several pairs of shoes! It took five men two weeks to clear everything and reveal a beautiful stone cliff-side practically reaching up to the Racic Mausoleum garden, located higher up the hill above the house, not to mention a gorgeous tree, which promptly fell down as its roots had been growing in the heap of rubbish! Due to the restrictions forbidding building work during the summer months, it took two years for the renovations to be finished but all was completed in 2004 and since then Donna and her husband visit twice a year at the beginning and the end of the tourist season; during the summer holiday months they rent it out. 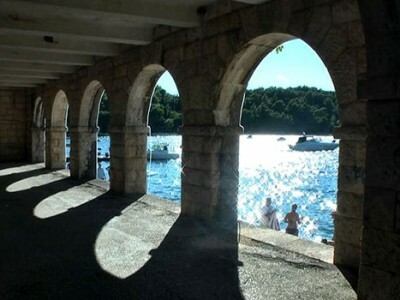 When they are in Cavtat there is always plenty for them to do to ensure that the house and garden are kept in tip-top condition but they still find plenty of time to enjoy all the lovely things Cavtat and the surrounding areas have to offer. After breakfast on the terrace, they often go into the old town to have coffee and meet the locals. They like to go to the same café regularly, as that way they find you can get to know the regulars, who then invite you to join them for coffee. Donna does manage to practise her Croatian a bit over coffee, although there is often a bit of a tussle as the regulars want to practise their English on Donna as well! Donna told me there are lots of beautiful walks in and around Cavtat. You can walk around the Rat peninsula or if you have an hour or more to spare you can walk all the way to Čilipi. This is a beautiful walk through all different kinds of trees and scrub, in sight of the sea and, on a good day, even the Elafiti Islands. Donna and her husband just love chilling out in Cavtat and rarely eat in in the evenings. They love to go out and try different wines and food and go to all sorts of different restaurants. One of their favourites is called Bugenvila which has a beautiful terrace on the quay. It is not the cheapest but they think it is brilliant and worth every kuna. There are many that are not so expensive and you can eat out quite cheaply, especially at lunch-time. They love the Rokatin Restaurant on the Rat peninsula for lunch. It is located by itself amongst the pine trees. You can have a swim and then enjoy grilled fish and salad for lunch, without having to change out of your swim suit. 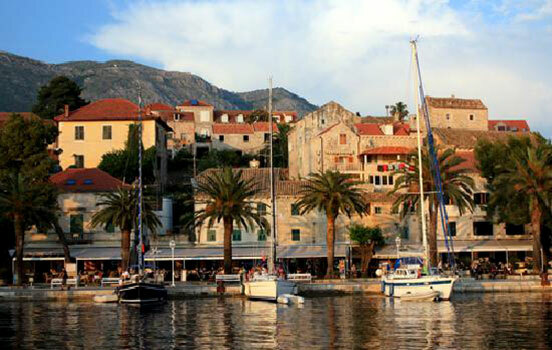 Cavtat is a very old town – so old, in fact, that it predates Dubrovnik. Originally it was called Epidaurus and some Roman ruins still remain in the town. The houses don’t go back to Roman times but they are every bit as old as those in Dubrovnik. A couple of Roman walls near the Racic Mausoleum are now being turned into a tourist attraction. The centre of Cavtat is very small and runs from quayside up the narrow streets away from waterfront. It is lovely just to wander along the narrow lanes and make your own discoveries, including a couple of interesing museums. One of them is the home of celebrated local artist, Vlaho Bukovac (1855-1922). In this house you can see rooms in which he painted the walls as well as some of his paintings, & beautiful old photographs which gives an interesting idea of Cavtat life in that era. 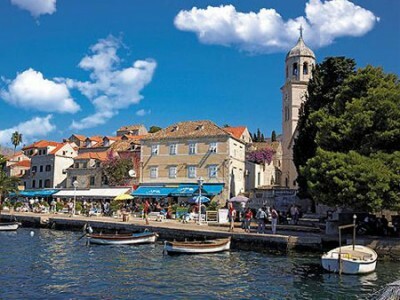 Although Cavtat gets pretty busy in the summer season, you can walk through town at other times a see not a single tourist. At the beginning of November, everyone starts to pack away for the winter, when it reverts to a much more peaceful working town inhabited almost exclusively by the locals. Winter has its own special charm and calm and it is sometimes beautiful to see the full moon rising over the peaceful town. The harbour, which is bursting with boats in the summer, then empties and no music issues from the cafes. Most hotels and practically all the restaurants close for the winter from mid-November when the locals gather in small groups in the cafes to reclaim their town until everything opens up again in March or April. If you happen to be a scuba diver, you can pay a visit to the Museum under the sea. 60ft down lies a big galleon, which is more or less intact and very interesting. Off the Rat peninsula lies the tiny island called Supetar. You can take a boat over there and enjoy a simple fish lunch. Being vegetarian, Donna hasn’t tried it out but has heard that it is very nice. One shop that Donna really likes is the tiny Skatulica, which sells all sorts of creams, soaps, skin and hair products, all made locally with no chemical preservatives and a whole variety of other Dalmation products including wine, stonework bowls , jewellery, honey, interesting vinegars, and lovely olive oils. The owner is very well read and knowledgeable. She makes and sells her own version of the orange & lemon peel sweets popular in the region and it is the best Donna has ever tasted. Donna had a bumper crop of lemons on her tree this year, she told me, and she gave at lot of them to Skatulica’s owner. In exchange, she received a bottle of Limoncello and packets of lemon peel sweets made with her very own lemons. If her tree has a good crop next year, they will be ripening nicely just in time for the CLS summer course and she will keep some for us! 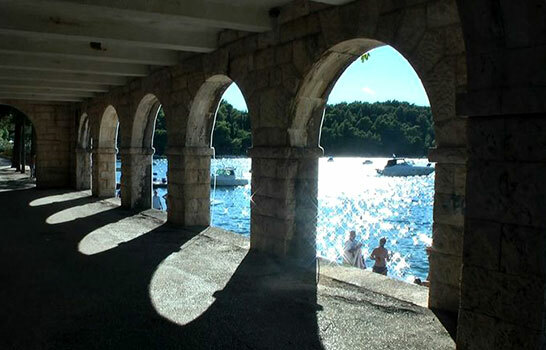 So already we can begin to see what is in store for any of us who are thinking of joining the group in Cavtat next June. I for one can hardly wait!